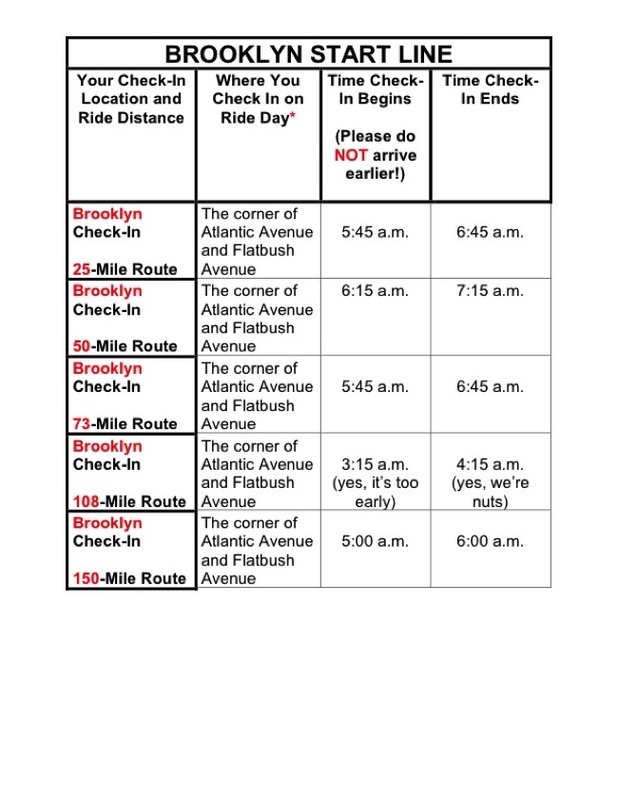 We do not release the route map or turn sheet in advance. I'm confused about the route I picked -- how do I get there? Where does it start? All the info right here. There’s ONLY one way -- click here. TWO inner tubes that fit your bike (even if you don’t know how to use them, someone else will). A small gym bag or daypack with a change of clothes and a towel for the free hot showers at the finish line. Your superb good sense of humor. If you want you can check in the day before the ride, which will get you riding faster on ride day. This is optional. There is a $12 charge for this. Details here. Where and When Do I Show Up on Ride Day? Just look below for the start line and distance you prefer. There is no water at the Mastic-Shirley start line. You MUST show up with your TWO water bottles ALREADY filled. 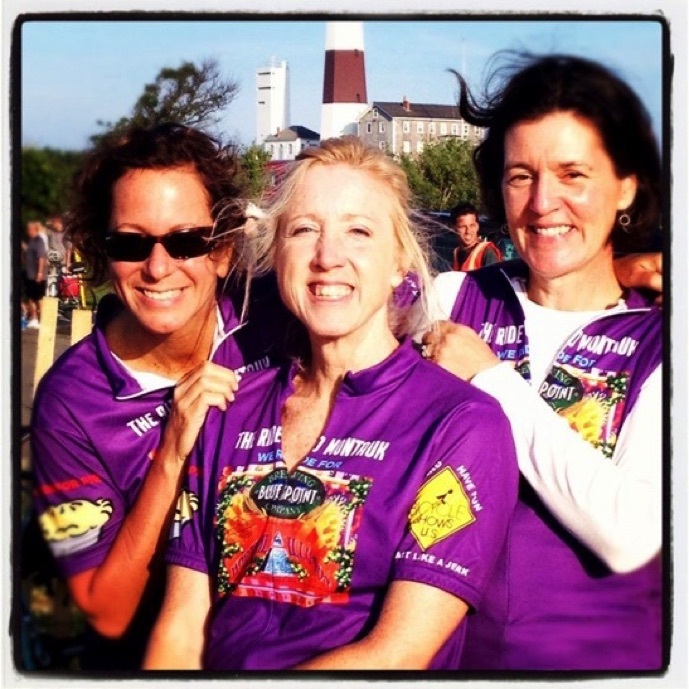 East Hampton is where the 25-mile riders actually start pedaling the ride. 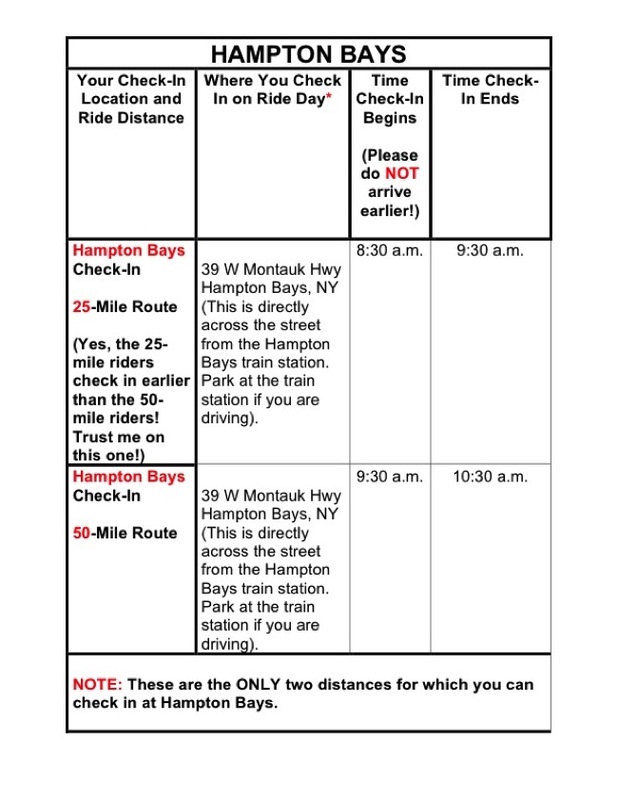 For 99% of you 25-mile riders, you’re going to check in at your choice of Manhattan, Brooklyn, Babylon, Hampton Bays, or Mastic-Shirley (see above) and we will transport your bike and you out to East Hampton for free. OK... are we alone now? Everyone else is gone? Good! Our Manhattan, Brooklyn, Babylon, Hampton Bays, and Mastic-Shirley start lines have all the goodies -- breakfast food, mechanics, water... at this location we’ll have NUTHIN’, since it’s not really a start line for us -- more of a transport depot. Our staff will be there to hand you your rider I.D. wristbands and route sheets, and there will be some portable toilets, but that’s it! Please be SURE to fill your water bottles before you leave the house. There is no transport back to this location for your bike or for you. If you leave a car here you will need to get a ride back here on your own -- we aren’t able to help with this, and we don’t know of any public transport that goes here. Complete finish line info is here. How Do I Get Home from Montauk? This is a one-way ride -- it ends in Montauk, NY and you need to find a way home for your bike and you. These are your choices. Get a lift home from a friend. Driving directions here. Take our optional transportation home on Saturday immediately after the ride. If you’re staying in Montauk you can leave your bike with us and we will delivery it to Manhattan, Brooklyn, Babylon, Hampton Bays, or Mastic-Shirley, where it will be guarded by our staff. You can pick your bike up on Sunday any time between 9 a.m. and 4 p.m. NOTE: Sunday bike pick-up for Brooklyn is 11 a.m. - 2 p.m.
We do NOT load bikes on Sunday itself. 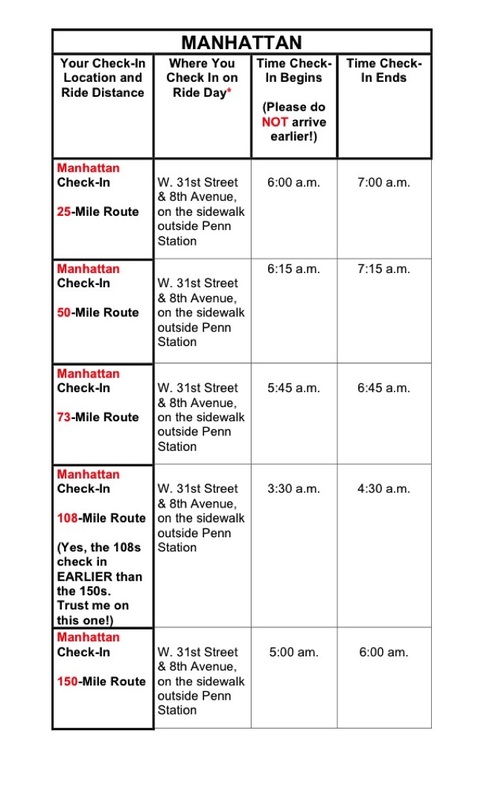 Bikes shipped back to Manhattan will be at W. 33rd Street between 11th Avenue and 12th Avenue. NOTE: We love Bicycle Habitat but they are NOT involved in this process -- it's just a great meeting place. So please don't call them with Ride to Montauk questions -- they don't know the asnwers, and nor should they! We ride rain or shine -- no rain date, but we do offer optional rain insurance here. Free showers after the ride -- bring a town, soap, and a change of clothes. We will drive a bag to Montauk for you so you don’t have to carry it. *A friendly note from Glen, your tour director and humble servant who loves you no really. If you decide to just read this one page and skip the rest of the web site that’s cool... see you on the ride! “I read the Quick Start Guide, but how come there wasn’t any info on [some topic that is covered clearly in excruciating detail elsewhere on this web site]? ... that person will be immediately transferred to our help desk in Bangalore, India. Of course if you DO read the web site, or at least TRY, and STILL can’t find the info you want, by all means drop us a note! We’re always glad to hear from you.